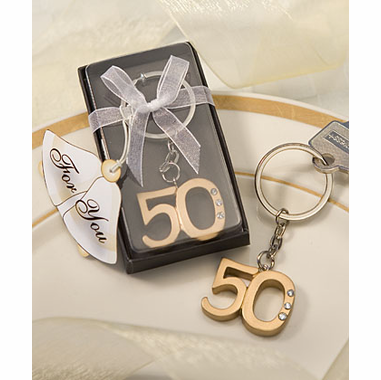 A golden anniversary party is truly something extraordinary and with these 50th anniversary keyring favors, your guest gift planning is made easy and affordable. 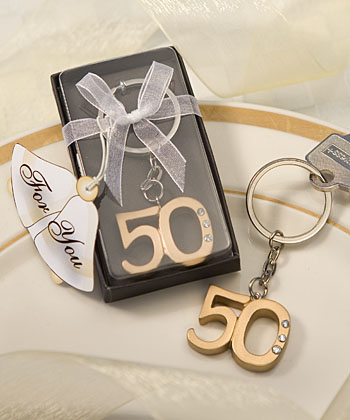 For the same reason, our customers love to use these as 50th birthday favors too! They are constructed of a sturdy chrome ring and chain attached to a gold color resin 50 charm with 3 rhinestone accent They measure .25" x 3" x 1" and come in a clear top box with black base bottom. The box is finished with a white organza bow and an attached gold wedding bell shape "For You" tag.